More democracy at Work! Fix the EU Company law package! says the European Trade Union Confederation (ETUC). 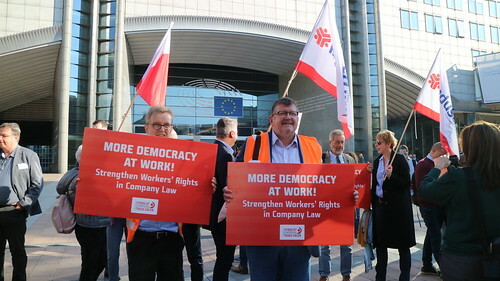 A rally for ‘More democracy at work’ on Wednesday 10 October at 16.30-17.30 on the Esplanade of the European Parliament. A debate on the Company Law Package in the European Parliament on Wednesday 17 October in Room JAN4Q2 with Evelyn Regner MEP, Peter Scherrer, ETUC Deputy General Secretary, Michael Vassiliadis, President of trade union industriAllEurope, and Josef Muchitsch, President of the Austrian Construction and Wood Workers Union and Austrian MP. Plus a Workshop in Rome on October 16 with MEP Sergio Cofferati and representatives of the Austrian Presidency and the Green and GUE groups in the European Parliament. At the October 10 rally the ETUC is also handing over to European Parliament Company Law package Rapporteur Evelyn Regner MEP an Appeal for More Democracy at Work signed by over 900 prominent individuals including Thomas Piketty, former Prime Ministers Enrico Letta and Poul Nyrup Rasmussen, Dany Cohn-Bendit, and many MEPs, academics and trade union leaders. “The European Commission’s Company Law package delivers for business on company mobility, transfer of seats, mergers and divisions but seems to have forgotten that working people also need rights and protection” said Peter Scherrer, ETUC Deputy General Secretary. “It wants to make it easier to have online registration of companies but without setting appropriate minimum standards. That’s just encouraging the establishment of letterbox companies for the purposes of avoiding taxation and social security contributions. “The company law package contains not one improvement of workplace democracy. There is nothing about workers representation in company boards across Europe, and this follows years of doing absolutely nothing about strengthening the European Works Council Directive. “In the 1980s corporate governance shifted to the Thatcherite/Reaganite ideal of maximising shareholder value which led directly to the crash of 2008. After years of austerity and rampant inequality you would have thought we might be able to move to a more sustainable model of corporate governance including improved workers participation with European minimum requirements/standards.